Description: Crest-Craft created a lot of Grateful Dead backstage passes from 1983 until 1995. 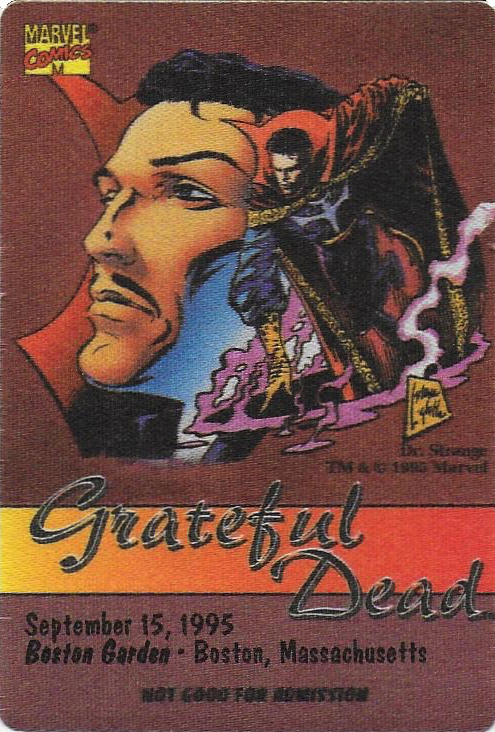 In 1995 they created a series of backstage passes with Marvel characters on the front. This backstage pass was created for the September 15, 1995 concert at the Boston Garden in Boston Massachusetts. This concert was cancelled because Jerry Garcia died on August 9th, 1995. 1500 of these passes were produced and shipped to the customer before the concert was cancelled. It is believed that most endured up in the Grateful Dead Vault. Jack Johnson, the President of Crest_Craft, maintains a personal collection with the passes, proofs, etc. All passes have a MacTac PS adhesive liner on the back with Crest-Craft information stamped on it.